Biodiesel Demand Grows Across Continents The ultimate clean fuel, at least at first glance, is vegetable oil. Plants make it from sunlight, water, and a greenhouse gas — and they remove carbon dioxide from the air as they grow. The oil is easily converted into fuel for diesel engines. Around the globe there's now a rush toward so-called "biodiesel." A Congressional effort to promote the U.S. biodiesel industry has producers on both sides of the Atlantic crying foul. The ultimate clean fuel, at least at first glance, is vegetable oil. Plants make it from sunlight, water, and a greenhouse gas — and they remove carbon dioxide from the air as they grow. The oil is easily converted into fuel for diesel engines. Europe is the king of biodiesel; it makes an estimated 77 percent of all biodiesel, worldwide, and Germany alone makes half of this amount. Part of the secret to its success has been a tax break at the pump. Berliner Dieter Weigel says he buys biodiesel because of the tax break. He filled up his station wagon with 100 percent biodiesel before heading on vacation this month. "It's 10 cents cheaper. The environmental aspect is not so important," Weigel says. "I think people should drive less for the environment, and not fill up biodiesel." 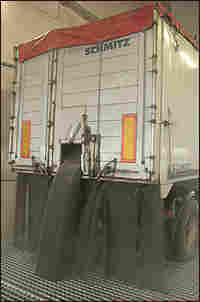 Biodiesel is made in Germany with rapeseed oil, a seed similar to canola. In most cars, it mixes easily with ordinary diesel. Its share of the market is expected to grow as Europe pushes for 10 percent of transport fuels — and 20 percent of overall energy use — to be renewable by 2020. Walking into biodiesel production plant Bio-Ölwerk Magdeburg is like entering a popcorn popper. It's hot — and it smells like frying oil. The machines don't pop exactly, but they bang. Business has been good enough that the plant is expanding. But Managing Director Rheinhard Kluge isn't sure this will last. Germany is ending the tax break for pure biofuel at the pump; instead, the government will demand that every liter of diesel fuel contain a little bit of biofuel. Kluge says that as a result, big oil and gas companies will be the winners in this business. "We had three good years here in this plant. Now I think we get three hard years. After that, we hope we survive," Kluge says. Other unintended consequences of the biodiesel boom are much bigger. In fact, they're global. Trucks daily dump rapeseed, grown nearby, at Bio-Ölwerk Magdeburg. Some farmers have expanded into the biofuel business by planting on land once required by law to stay fallow. Others have put in rapeseed where wheat or barley once grew. Critics say this pits growing fuel against growing food. George Monbiot, author of Heat: How to Stop the Planet Burning, says agricultural land worldwide is already under stress from drought and urbanization. "When you add the biofuels market to this mix, you see what could be a recipe for catastrophe. Already with far less than 1 percent of the world's transport fuel coming from biofuel, we've seen a doubling in the price of corn, and near in price of wheat," Monbiot says. European Union officials contest this thought, saying that just a small proportion of the cost of food is related to the cost of the ingredients. But Monbiot and other critics want Europe to stop pushing biofuels until gasoline and diesel from corn stalks, straw, or even sewage are commercially available. That could happen in the next 15 years, according to some estimates. There's another difficulty: Europe can't produce enough biodiesel to satisfy the expected demand, which means there will be imports from places like palm oil plantations in Indonesia. The pressure is getting through in Europe. The European Union is drafting new rules for countries to use biofuel that is "sustainable." And the industry is setting up its own sustainable certification program. Skeptics aren't sure such certificates can be trusted. But Ian Brinkman of Biox, a Dutch company importing palm oil for power plants, says its sustainable production will grow if consumers demand it. "The larger the demand will be, the higher the price will be for sustainable produced palm oil," Brinkman says. "So, the larger the incentive for producers to change to sustainable practices." Given the technological, environmental, and political constraints, Peter Jensen with the European Environment Agency says it's just hard to replace fossil fuel. "We are looking for alternatives to a solution that has actually worked quite well for 100 years," Jensen says. Biofuels are still seen here as the most immediately available way to reduce carbon emissions. But in the search for a green fuel, the bloom is off rapeseed or palm. Europe is the world's leader in biodiesel production, accounting for three-quarters of last year's global output of the alternative fuel. The United States is No. 2, but its production lags far behind. In 2004, Congress passed a tax credit intended to promote the U.S. biodiesel industry. The tax credit equals a dollar for every gallon of biodiesel blended in the United States. The idea was to encourage marketers of regular diesel to mix in plant-based fuel and, thus, broaden the use of biodiesel. But a loophole has producers on both sides of the Atlantic crying foul. Biodiesel and petroleum-based diesel mix easily together. The U.S. law allows producers to claim the tax credit for any level of blend. In the United States, blenders taking advantage of the credit have usually produced mixes of mostly petroleum diesel with, generally, up to 10 percent biodiesel, for the U.S. market. Most diesel engines can handle a blend that includes 20 percent biodiesel, known as B20, with no additional maintenance. Many can readily use 100 percent biodiesel, called B100. But the law did not anticipate "splash and dash" — a loophole in the system. This practice involves bringing a tanker of biodiesel made elsewhere, usually Indonesia or Malaysia, to the United States, adding just a "splash" of U.S.-made petroleum diesel, then shipping the "blend" to Europe for sale. Adding just 0.1 percent petroleum diesel to a load of biodiesel while at a U.S. dock is enough to qualify for the credit. U.S. critics say it rewards biodiesel producers — both foreign and domestic — without any real benefit to U.S. taxpayers, who are paying the bill. European critics say it's an unfair trade practice that's undercutting their market. European biodiesel producers first cried foul when U.S. government-subsidized blends of 99.9 percent biodiesel and 0.1 percent petroleum diesel began showing up on the European market. They argued that they were being unfairly undercut by an illegal subsidy, and lobbied the European Union to fight the practice on the grounds that it creates unfair competition. "This system clearly represents an unfair trade measure that urgently needs to be reviewed and eliminated – at least in its unfair trade aspects — by the U.S. government," officials of Europe's leading industry group, the European Biodiesel Board, wrote in a letter earlier this year to the European Trade Commissioner. Commission sources say there is no doubt in Brussels that the subsidized B99 "is causing damage to the EU biodiesel producers." American producers also became concerned with the practice when biodiesel producers from other countries started taking advantage of the program. Jenna Higgins with the National Biodiesel Board, a U.S. industry group, calls this practice an "abuse" of congressional intent. As the law currently stands, she says, no American biodiesel producers have to be involved in order for foreign "splash and dashers" to claim the U.S. tax break. Higgins says the tax credit for biodiesel blends is important for the domestic industry. "This really is the main federal incentive for biodiesel," Higgins says. "If we don't work to close the loophole, it's possible the entire biodiesel tax credit will go away for everyone. And that would be devastating for the entire U.S. biodiesel industry." The tax credit is scheduled to phase out at the end of 2008, but there is legislation pending that could end the "splash and dash" loophole sooner. It's hard to predict whether the subsidy will be changed. For one thing, although the European producers complain about it, there is nothing to stop European biodiesel companies from shipping to the United States and taking advantage of the credit. Indeed, some reports suggest that is already happening. And despite the concerns expressed by Higgins, some American companies are certainly benefiting from the subsidy — either by exporting made-in-the-U.S. biodiesel blends, or by importing loads of biodiesel, adding a touch of petroleum, then re-selling the subsidized blend abroad. 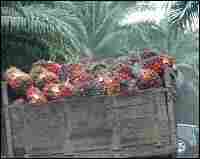 Indonesia and neighboring Malaysia account for about 80 percent of the world's palm oil production. Palm oil is used for cooking and cosmetics, as well as for fuel. Demand is increasing every day — putting pressure, environmentalists say, on the region's tropical forests, which are home to some of the world's most exotic and endangered species. Also, cutting down these forests releases huge amounts of carbon from the soil. But palm oil producers complain they're getting a bad rap. "There's a misconception that oil palms are the reason for the destruction of the forests in Indonesia, which is not true," says Pat Baskett, who runs PT Socfin, a palm oil company that has been operating in Indonesia for 100 years. "Basically, the destruction of the forest is from timber operations," Baskett says. ""...Certainly there may be companies who are felling jungle, virgin jungle, for oil palms. But basically the vast majority of plantation companies are establishing oil palms on already logged-out land." Many environmentalists working in the region agree that logging — whether legal or not — is a bigger threat to the forest than palm oil plantations, for now. But as worldwide appetite for palm oil continues to grow, it may put more pressure on Southeast Asia's forests. Maybe palm oil isn't the solution. But what about oil from other plants? Some companies say the solution lies in biotech— new, genetically modified crops raised specifically to make fuel. But this idea, too, is raising concerns. Camelina sativa looks like a common weed. But it's not as boring as it appears. Like canola, its seeds contain oil. And it has some pretty weird traits. "I have some camelina seeds in here, as you can see, they are very small," says Fernando Guillen, a professional plant-breeder working with camelina in Bozeman, Mont. The seeds in Guillen's test tube react to water by forming a clear jelly. In minutes, they're swimming in the goop. Guillen says it's a survival mechanism — in case of drought. "Even though the soil is dry, you know, at night there might (be) a little moisture, and that tiny amount of moisture is captured by the seed," Guillen says. "And that gel is going to be the resource for the seed to start germination." Not only is camelina drought-resistant, it also needs less fertilizer than other crops. Its promoters think it could be a boon for western states, where farmers could grow it on poor land to produce oil for the biodiesel fuel industry. But geneticists, like Jay DeRocher, think they can make camelina even better. DeRocher is scientific director of Targeted Growth, a Seattle company that uses genetic engineering to increase crop yields. In his lab, DeRocher is altering camelina's genetic code — specifically, a gene that tells cells when to stop dividing. The same gene exists in animals, and when it works right, it blocks the kind of uncontrolled cell division that leads to cancer. 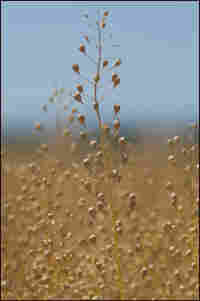 But in camelina, DeRocher is tweaking the gene to do the opposite — to allow the plant's cells to divide a little longer. "The idea is, if you want to increase growth, you can remove that blocking function, then you will get more cell division and more growth," DeRocher says. He says modifying the gene could increase camelina's production of oil seeds by as much as 30 percent per acre, which would mean 30 percent more home-grown, eco-friendly biodiesel. But some environmentalists are not impressed. "There's many questions that need to be answered about it," says Neil Carmen, a botanist who serves on the Sierra Club's Genetic Engineering Committee. He points out that camelina is sometimes classified as a "weed," and he wonders what the plant might do once it's been genetically modified to produce more seeds than normal. "We don't want to find 10 years from now that, you know, we've released another massive weed on the environment and now we have to spend money to resolve that problem," Carmen says. So far, Targeted Growth hasn't seen any sign that it spreads into neighboring fields — or that it might cross-pollinate with related plants nearby, in its tests of the plant. "I would much rather allow good genetic engineering of crops for fuel than I would allow non-double-hulled tankers full of oil running through the Alaska coastline," says Tom Todaro, CEO of Targeted Growth. "One's more likely to lead to problems than the other." The company is ramping up production of conventional camelina seed; it hopes to plant 100,000 acres next year. The genetically engineered version will take longer. Government approval is going to take at least another eight years, and millions of dollars in testing. But DeRocher says it will be worth it. The company is betting that rising oil prices and growing worries about global warming will soon make the market more tolerant of a little genetic engineering.